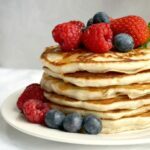 Fluffy Egg-Free Pancakes Recipe from scratch, a delicious and healthy breakfast or brunch treat. Ready in about 15 minutes only, these pancakes are the very best you can get. No sugar added. Ok, I must confess, I wasn’t planning to make egg-free pancakes, but regular ones. I only realised there were no eggs left after I had promised the little ones pancakes. And God forbid you promise something to kids and not keep your word! That’s it, there is no going back, and pancakes had to be made. Luckily, I did have everything else I needed, so the rest was easy peasy. And even without eggs, these pancakes are the fluffiest, yummiest, and easiest to make. You can’t possibly go wrong with this recipe. 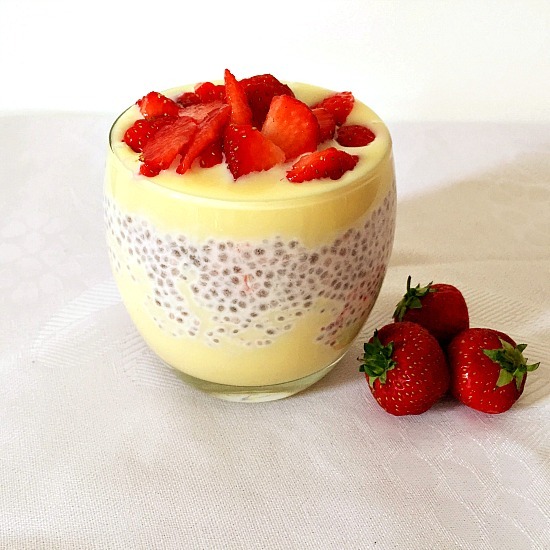 And if you have egg allergy, then this definitely is the recipe for you! I find myself making pancakes pretty often nowadays, since my daughters like them for breakfast. 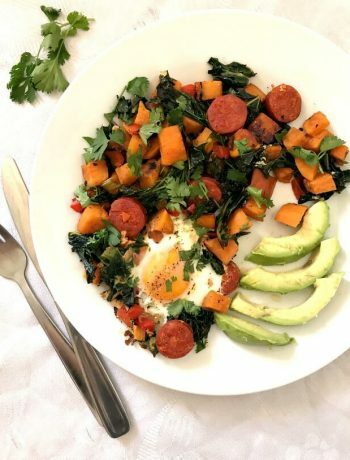 I try to make their daily menu as interesting as possible, and, ideally, as healthy as possible. Kids can be pretty funny about wanting the same thing all the time, so, keeping a varied menu helps them be more opened towards new foods. 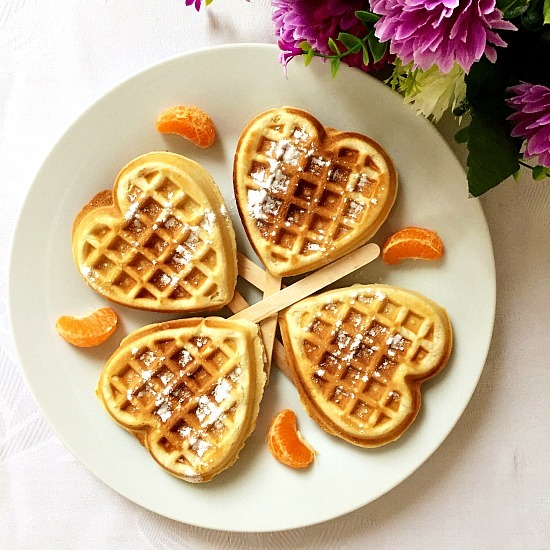 And since my little ones are not keen on muffins, then pancakes all the way. I also made Fluffy American Pancakes with Walnuts and Bananas and Banana Chocolate Chip Pancakes, and those were a big hit too. I personally think that BANANAS ARE THE BEST EGG SUBSTITUTE when it comes to anything sweet. Now, again, I don’t usually worry about eggs in a recipe, but when I do use bananas, I get perfect results every single time. Just ensure that the bananas are well ripen, in this way the also give sweetness and more flavour, which means you can safely cut down on the amount of refined sugar. A win-win situation, if you ask me. Also, BAKING POWDER HELPS TOO. 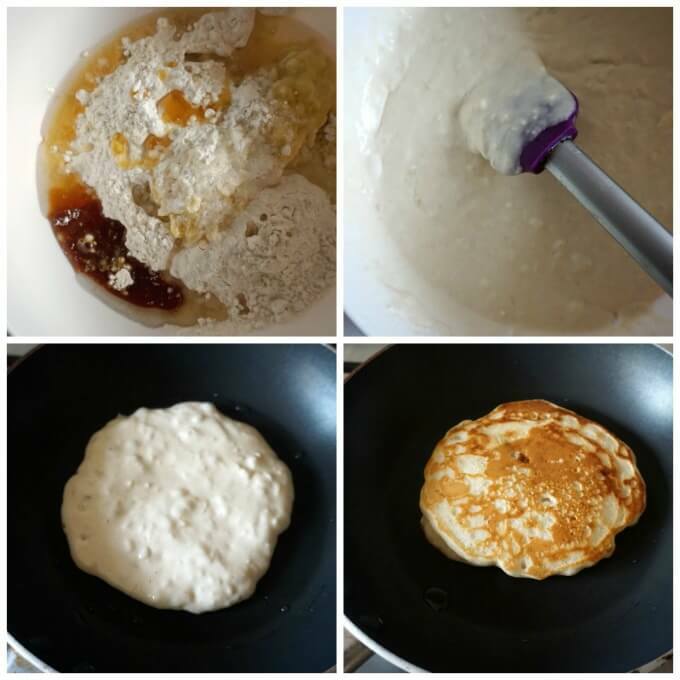 Add half a teaspoon (I find that more than that gives a funny taste to the pancakes), and just use plain flour, the pancakes will be perfectly done. DO USE COCONUT OIL TOO, it adds a nice flavour, and helps replace the egg too. 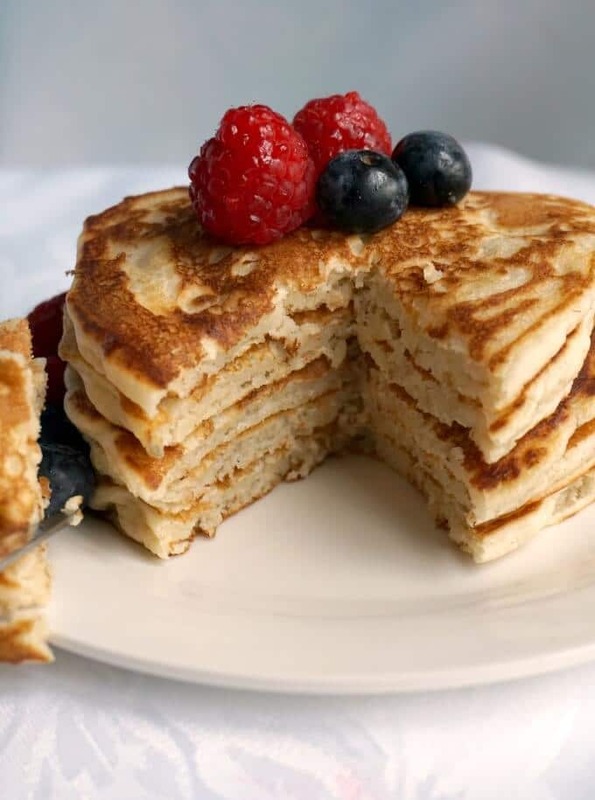 You know me already, I try to reduce the amount of sugar whenever possible, so do feel free to add some sugar to these pancakes if you find them boring. Although, if you have them with honey or maple syrup, and fully ripen fruit, I would say that is pretty sweet anyway. Right, so how to get these beauties perfectly fluffy and yummy? first of all, do make sure the heat is on low, so that you don’t burn the pancakes. I find that if they cook way too quickly, chances are they won’t have the right texture, so better take your time. Not that they take too long anyway. And that is all, a delicious egg-free pancakes recipe to lick your fingers clean. If you’ve tried my EGG-FREE PANCAKES or any other recipe on the blog then don’t forget to rate the recipe and let me know how you got on in the comments below, I love hearing from you! You can also FOLLOW ME on FACEBOOK, INSTAGRAM and PINTEREST to see more delicious food and what I’m getting up to. 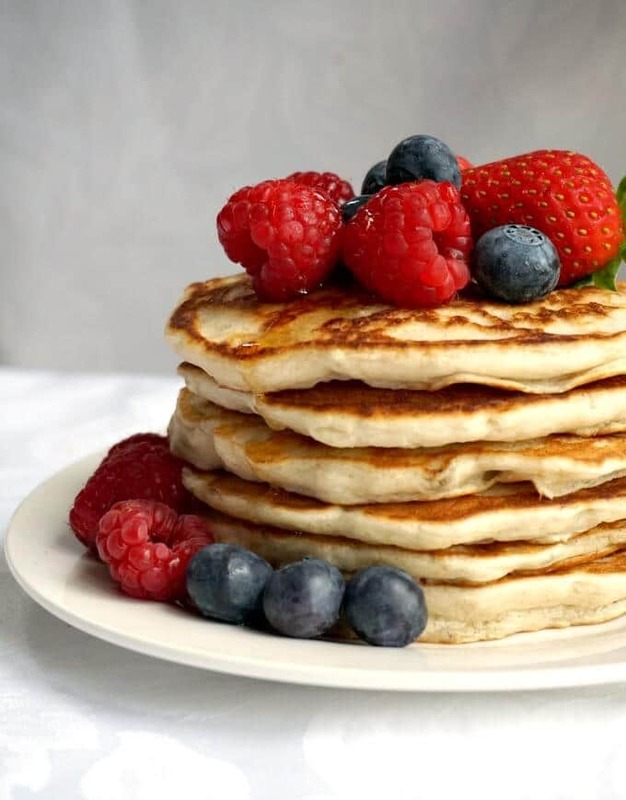 Fluffy Egg-Free Pancakes with Berries, a delicious and healthy breakfast or brunch treat. Ready in about 15 minutes only, these pancakes are the very best you can get. In a bowl, sift the flour, add the baking powder and mix. Use a fork to mash the banana. Add the milk, vanilla extract, mashed banana and melted coconut oil and use a spatula to mix everything into a batter. Heat up a frying pan, add a bit of vegetable oil, then add a laddleful of batter to the pan. Cook for about 1 minute or until small bubbles start to form on top, then flip over to the other side and cook for a further one minute or so. Serve the pancakes with fresh berries, honey or maple syrup.